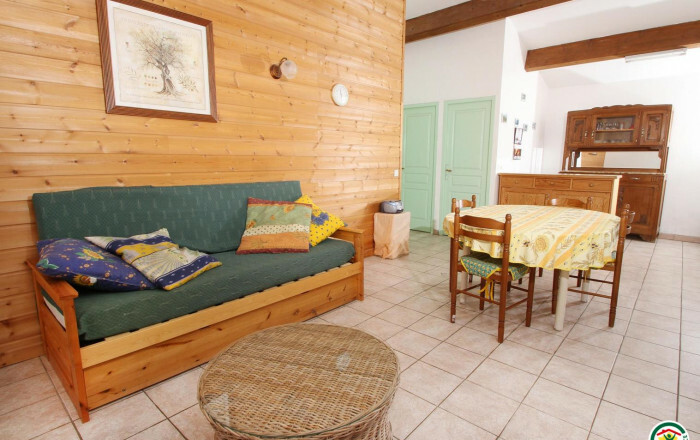 Self-contained gîte near farm and two guest rooms (B&B), overlooking Ouveze valley. Family farm (fruit trees: cherries, apricots, plums, olives). At heart of Les Baronnies Provençales Regional Nature park, 10 min. from Buis-les-Baronnies, a popular sports destination (Via Ferrata, climbing routes, cycling, mountain biking, running, hiking, horse riding, etc.). It's also a great place to relax and/or admire lovely old stone buildings. Montbrun-les-Bains (25km), classed as one of the loveliest villages in France. Typical Provençal villages at Nyons (35km) or Buis-les-Baronnies. Small hen run on site. Accommodation on 1st floor: kitchen area, bedroom (double bed), large living room (wood pellet stove, single bed + pull-out bed), shower room.